A few weeks ago, I was standing in the Italian foods section of Trader Joe's and found myself staring at a log of polenta. I'd had it once before, with Italian food, but I had no idea what to do with it to make it taste any good. But it was fairly cheap, and I'm sick of pasta with our red sauce, so I threw it into my cart. Last week, I finally dug it out of the cupboard and sliced it up and pan-fried it in some butter, olive oil, and garlic and served it as a side with dinner. Huh. Not too shabby. 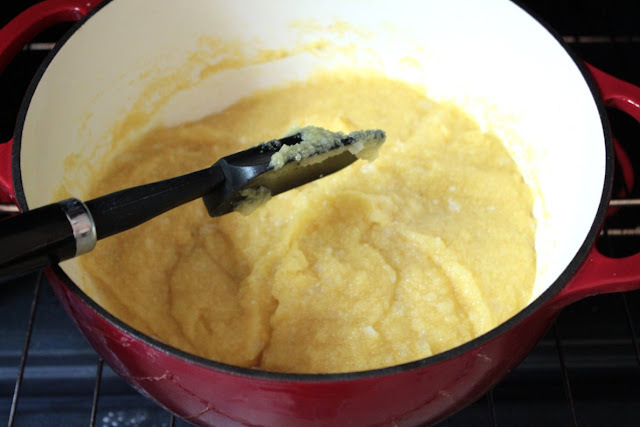 One of my twitter pals encouraged me to make my own polenta from scratch and swore it was really simple and much tastier. I whipped out my trusty Italian Bible of a cookbook by Marcella Hazan and found an entire section devoted to polenta! But her recipe required stirring a hot pot for a solid 20 minutes. Ummmm... no thank you. At least not until October when the weather cools back down. So I went Googling and found Alton Brown's method with a lot of excellent reviews. 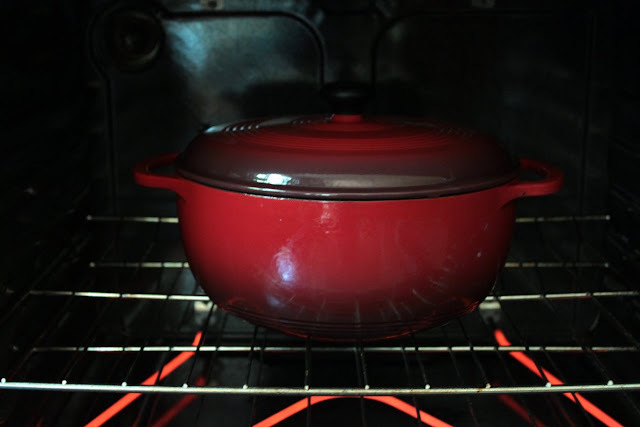 His method uses the oven for heat and you only stir once every 10 minutes. Much more do-able! Plus, I could get to work on other things during my 10-minute spurts of cook time. 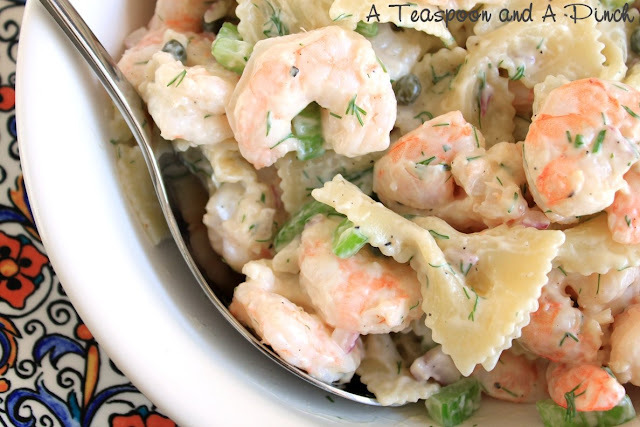 We loved this recipe. It's sinfully rich and creamy, and the parmesan gives it a flavor very similar to homemade macaroni and cheese. We ate it warm from the pot as a side with bbq chicken - perfect! 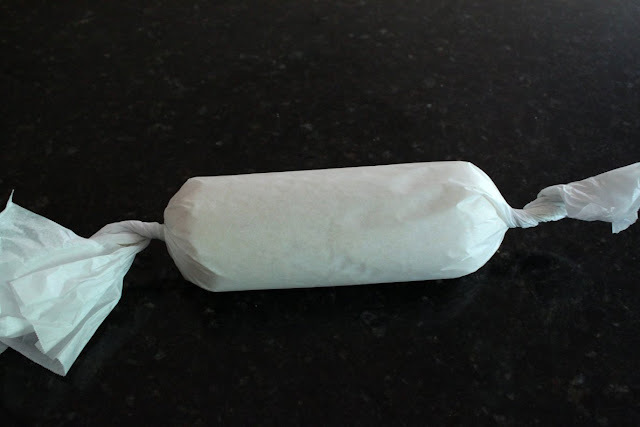 Also, at the bottom of this post, I include photos for storing leftovers. Want to know the difference between grits and polenta? Watch Alton Brown explain it in this video. 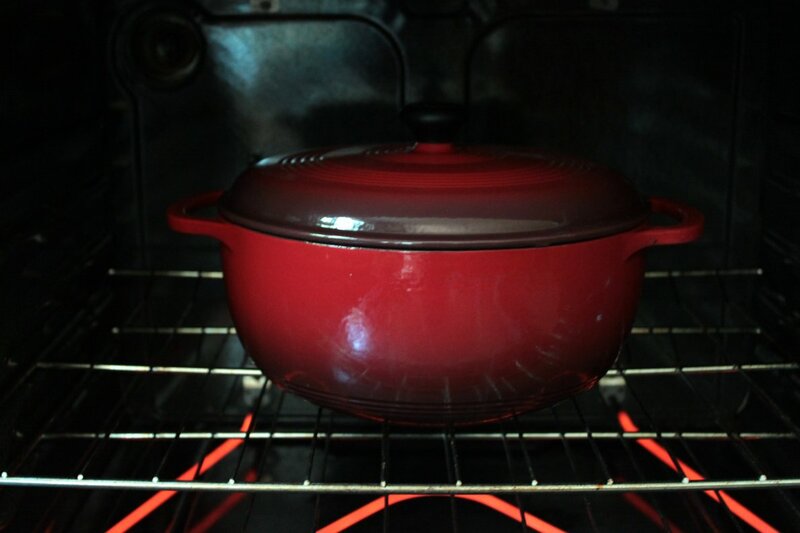 In a large, oven-safe saucepan or dutch oven, heat the olive oil over medium heat. Add the onion and a pinch of kosher salt and sweat until the onions begin to turn translucent, approximately 4 to 5 minutes. Reduce the heat to low, add the garlic, and saute for 1 to 2 minutes, making sure the garlic does not burn. Turn the heat up to high, add the chicken stock, and bring to a boil. 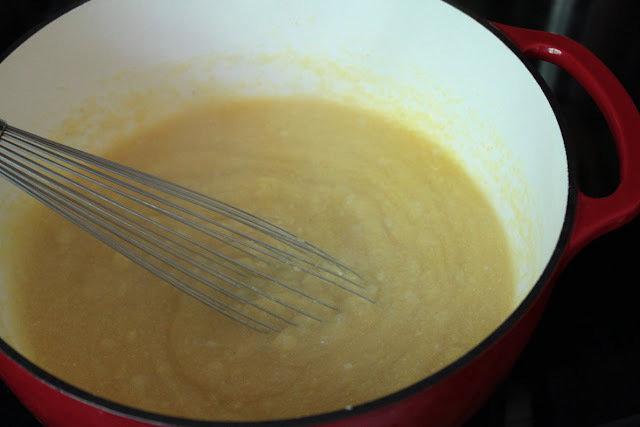 Gradually add the cornmeal while continually whisking, to avoid lumps. Once you have added all of the cornmeal, cover the pot and place it in the oven. Cook for 35 to 40 minutes, stirring every 10 minutes to prevent lumps. Once the mixture is creamy, remove from the oven and add the butter, a pinch of kosher salt, and pepper. 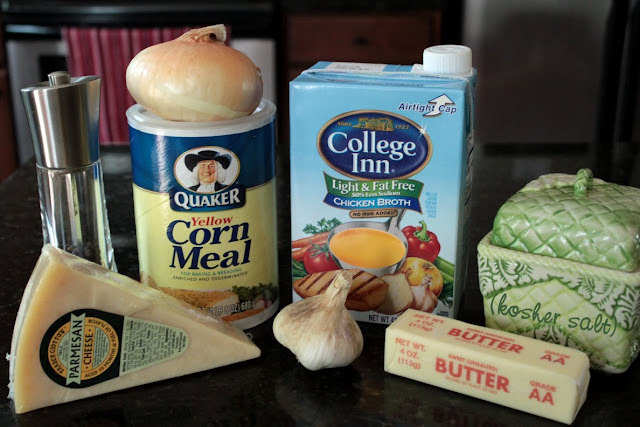 Once they are incorporated, gradually add the Parmesan and stir until melted. Serve as is, or pour the polenta into 9x13" cake pan lined with parchment paper. 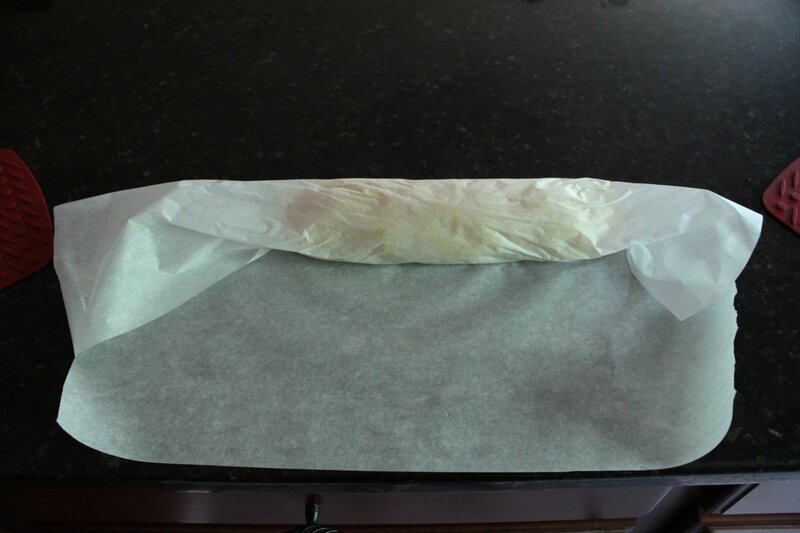 Place in the refrigerator to cool completely. 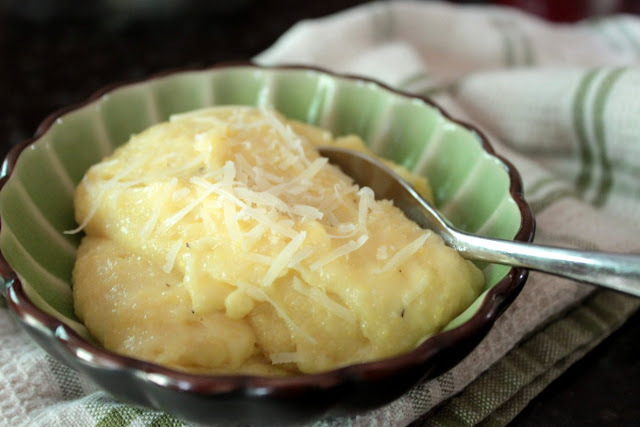 Once set, turn the polenta out onto a cutting board and cut into squares, rounds, or triangles. 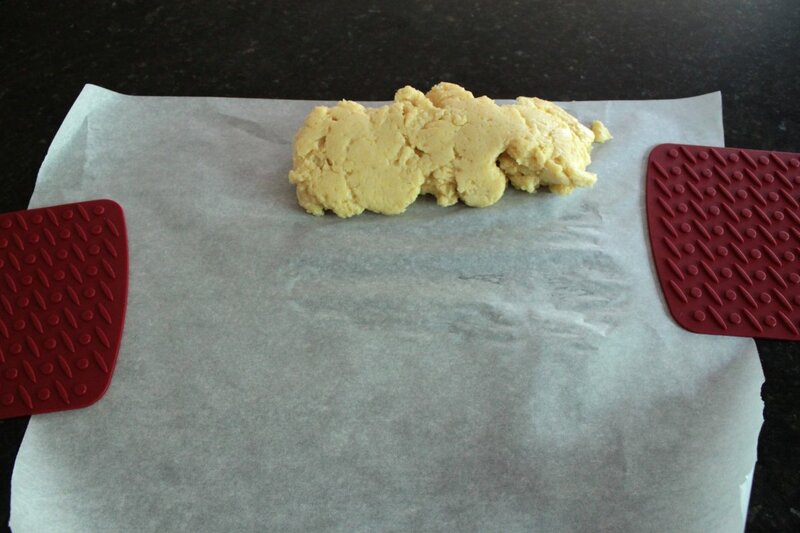 Or, shape your leftovers into a log and chill; then simply slice circles that are 1/2" thick. Saute in a nonstick skillet over medium heat, or grill. 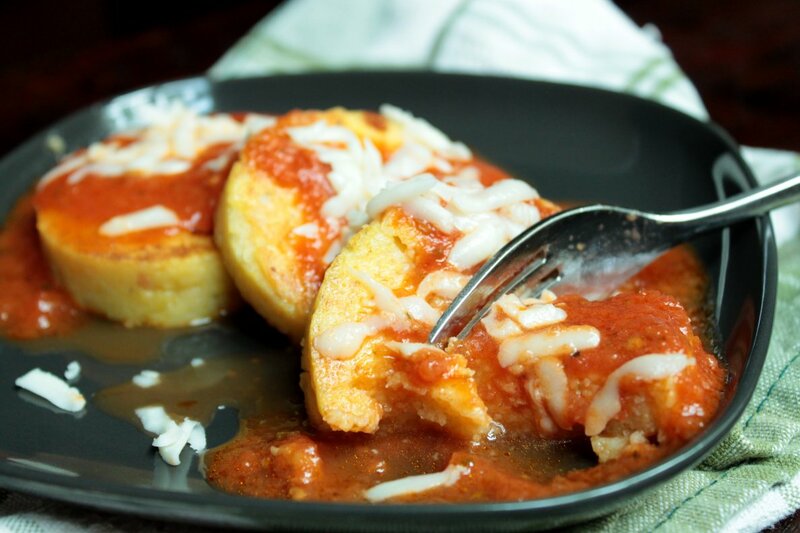 Serve with your favorite sauce or cheese. 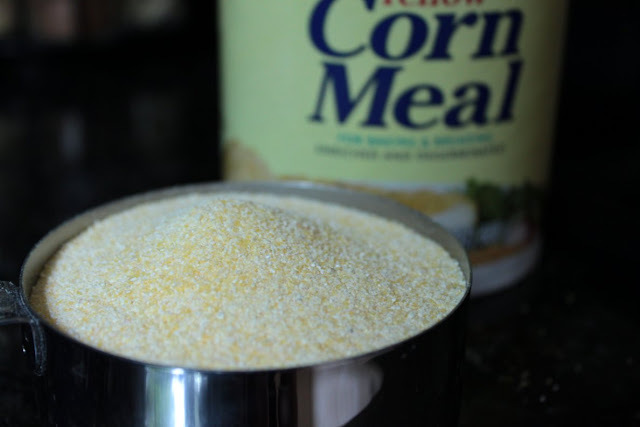 Use coarse grained corn meal for this recipe. 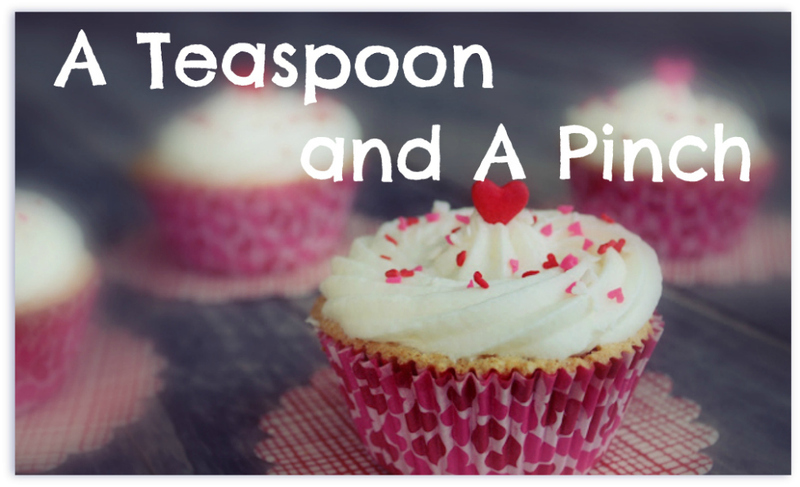 When you shake the container, you can hear the grains, unlike shaking a container of flour. I love using coarse grained corn meal in my cornbread recipe too; it makes the texture so amazing. A silicone "spoonula" works awesomely for scraping the bottom of the hot pot. 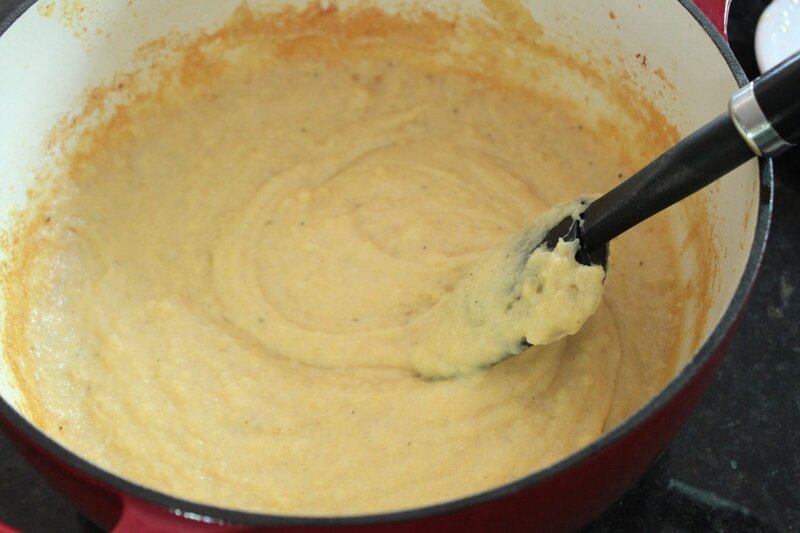 After the polenta is finished baking, stir in butter, salt, and pepper until smooth and combined. 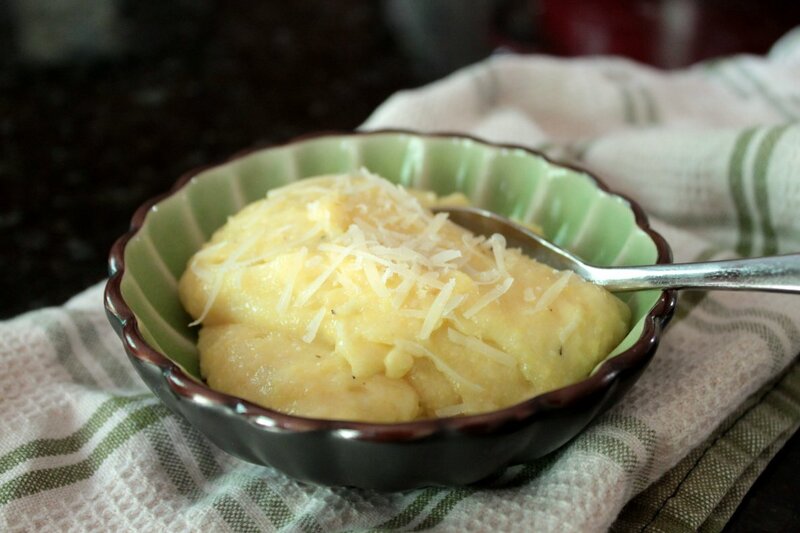 Then stir in parmesan cheese until thoroughly melted and the polenta is creamy. That looks super tasty. I've always been slightly wary of polenta, perhaps it's time to give it another chance. Kudos to you for trying something new!